Hello all! I have a guest poster today…like the best guest poster ever! 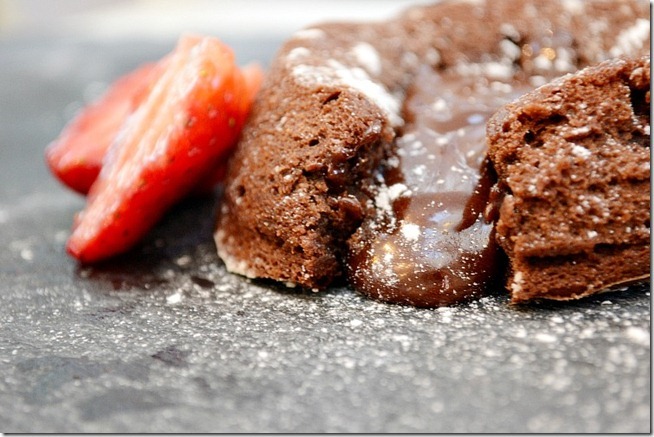 She has mad baking skillz and is sharing her delicious recipe for Molten Lava Cake…yummm! Her name is Katie…recognize her? Some of you may…she is the daughter of one of my bloggy BFF’s, Janel from Nellie Bellie! This is a photo from Katie’s Tea Party…isn’t she the cutest?!?! Hello. My name is Katie Jane. I am fifteen and my mother is NellieBellie. Currently, I am watching American Idol, because the mean people on it make me feel like a better person in comparison. I was told that I should write a bio about myself, so I am momentarily turning my attention to this instead. I very much enjoy baking and fashion. I think that the boys of One Direction are the most perfect looking beings on Earth (besides my mother and best friends. And also my father and little brother because I can’t forget them) and I have a weakness for puppy chow and brownies. I think that I also like elephant ears but I haven’t had them for like three years so I’m not for sure. I want to own a bakery when I get older, or write for Elle, Glamour, or Vogue. I want to go to Oxford University. My favorite shows on Earth are Downton Abbey and Sherlock, and I quite like Old Victorian things. I love my two Pooh Bears and my two kitties, and when I go to bed I like all four of them to be there. I very much like Bruno Mars as well. Yes. Look at the yummy cake. Inside it’s gooey. Gooey gooey gooey, like it’s giving you a hug from the inside. You know you want it, and you’d be crazy not to. Who wouldn’t want something as lovely as this? Maybe Christina Aguilera . Because she’s scary. Place in oven and bake for 14 minutes. The edges should be firm but the center will be runny.This is important to remember! 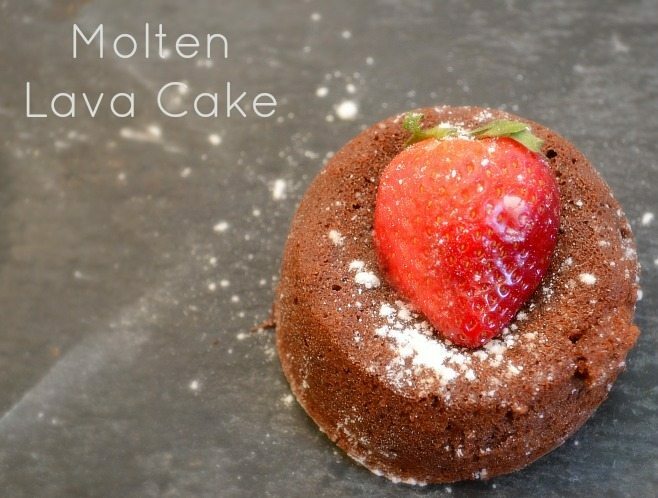 Don’t wait until the center is firm, because then it will no longer be a lava cake. It will be a brownie-cake-type-thing. Still yummy, but not what you wanted. So now what are you going to do with the cakes? I know what I’ll be doing. I’ll be eating all six of them up in my room while rewatching the first two seasons of Downton Abbey and Sherlock while the rest of the world is giving them to their Valentines and I shall have NO REGRETS. Thank you so much for sharing with us, Katie!!! I hope you will come back and share again! I am going to try to make these for Valentine’s Day for sure, even though I ‘d much rather Katie come make them for me! Mmm… this looks amazingly good! This is the best post I’ve read all day! I just love that Katie girl! And paired with a molten lava cake recipe? What could be better? Omg. Katie, let me know when you start your blog so I can read it! Loved this post. :) And that cake? AMAZING. I’m in trouble with this recipe. Aha, you’ll know if I ever start a blog. :) Thanks! The cakes can make us feel better as we cry. I think I should have Katie write all my posts from now on. I wonder if she freelances? Much more interesting then what I write. Must be all that Downton Abbey? Note to self; watch more Downton Abbey. She definitely freelances, if her mom lets her. She usually asks for payment in chocolate or Wonka candy, though. Katie Jane – you are a hoot, my dear! And that cake you made? UN-flippin’-believable!! What a fantastic looking desert! I could just eat that one totally up. I’ts so amazing and so are the photographs! oh, yum! These look amazing! When is this girl going to get her own blog? Hilarious! Nice I love lava anything, these cakes look fabulous! And congrats Katie Jane this is an awesome post with personality ALL over it! Oh my! Must. Have. That. Cake. Maybe I can drown my sorrows in it after watching Downton? Great post! This looks so yummy and I would hide in my room and eat them all by myself. No sharing!! Katie you are too cute and your cake looks delicious! I am seriously going to have to start watching this Downton Abby show, it seems that everyone I talk to is in love with it. YUM Katie!!! Can you come live with me?!? Delicious and perfect for Valentine’s day dinner dessert!